Partner Russ Herman has been named a 2012 Peoples Health Champion for his exceptional accomplishments after age 65. Russ was recognized at the Saints vs. Falcons home game on Sunday, November 11, 2012. The Peoples Health Champions program was created by Peoples Health, in collaboration with the New Orleans Saints, to recognize the exceptional achievement of New Orleans locals age 65 and older. Herman, Herman & Katz L.L.C., is proud to have three of our partner attorneys included in Lawdragon’s 500 Leading Lawyers in America. Russ Herman, Stephen Herman and Steven Lane were chosen from a list of 3,000 national finalists, placing them among what Lawdragon considers to be the nation’s top attorneys, and representing less than 1% of our entire profession. It’s an honor they share with Supreme Court Justices and the U.S. Attorney General. Five HHK Partners Named Benchmark Plaintiff Litigation "Local Litigation Stars"
Herman, Herman & Katz partners Russ Herman, Steven Lane, James "Jim" Klick, Leonard Davis and Stephen Herman have been selected by their peers for inclusion in the 2013 edition Benchmark Plaintiff Litigation. HH&K partner Stephen J. Herman was recently the subject of a "LAWDRAGON" interview, in which he discussed his experience in the BP Oil Spill litigation and the Scott v. American Tobacco case, which he describes as "the greatest accomplishment that I have been associated with. I was one of many, but I played a significant role." Lawdragon : It might still be too soon, but so far, how has the BP oil spill case affected your practice and your personal life, or has it? On May 31, Brian Katz was named a Louisiana Bar Foundation's Fellow, Class of 2012 . The Louisiana Bar Foundation (LBF) is a non-profit 501(c)(3) entity that supports programs that provide free legal services in all 64 parishes of the state of Louisiana. The LBF's mission is to "preserve, honor, and improve" the justice system by "promoting efforts which enhance the legal profession, increase public understanding of the legal system and advance the reality of equal justice under the law." 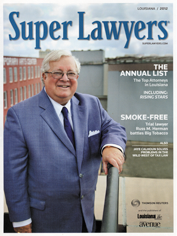 Herman, Herman, & Katz partners Leonard Davis, Maury Herman, Russ Herman, Stephen Herman, James "Jim" Klick, Morton Katz and Steven Lane have been named Super Lawyers for 2012 by Super Lawyers magazine. Attorneys Leonard Davis and Stephen Herman were recognized for their successful work in Class Action/Mass Torts Litigation; Maury Herman, Morton Katz and Jim Klick were each recognized in the field of Personal Injury (Plaintiff) Litigation; Russ Herman was named to the list for his work in Business Litigation; and Steven Lane was recognized in the field of Family Law. Herman, Herman & Katz partners Russ Herman, Steven Lane, James "Jim" Klick, Leonard Davis and Brian Katz have been selected by their peers for inclusion in the 2012 edition of The Best Lawyers in America, which is considered one of the leading guides for legal excellence in the country. Attorney Jeremy Epstein of Herman, Herman & Katz LLC, has been appointed to the American Association for Justice's (AAJ) New Lawyers Division (NLD) Law Schools Committee, which is charged with helping to create a presence for the AAJ among students in area law schools. Herman, Herman & Katz L.L.C. has been named one of the "Top Tier" recommended law firms in the country by The Legal 500 for plaintiff representation in mass torts and class actions, specifically pharmaceuticals and medical devices. The Legal 500 is an independent guide in which firms and individuals are recommended purely on merit, and excerpts from the peer-submitted reviews accompany each firms' or attorney's recommendation. Jennifer Greene, who has been involved with the New Orleans chapter of the Susan G. Komen For the Cure New Orleans affiliate for the past seven years, has been appointed to its Board of Directors. Susan G. Komen for the Cure ("Komen") is the world's largest grassroots network of breast cancer survivors and activists. Over the last 28 years, Komen has invested over $1.5 billion for research, education, screening, treatment and other community breast health programs. Komen is the leader in the global movement to save lives and end breast cancer forever. Herman, Herman & Katz L.L.P. is proud to announce Jed Cain as the firm's newest partner. Mr. Cain has been with the firm since his clerkship while he was earning his J.D. at Tulane University Law School, and he became an associate with the firm in the summer of 2005. "I am honored to be joining the firm as a partner," says Cain. "Herman, Herman & Katz has been such a huge part of my life and my legal career. I'm eager to continue working hard as a part of a team that is focused on bringing justice to our clients and the community at large." On April 1, Stephen Herman was inducted into the Louisiana Bar Foundation's Fellows, Class of 2010 . The Louisiana Bar Foundation (LBF) is a non-profit 501(c)(3) entity that supports programs that provide free legal services in all 64 parishes of the state of Louisiana. Russ Herman has been chosen for Chambers USA 2011- Leaders in their Field. He has been recommended in Litigation, General Commercial (Louisiana), Products Liability and Plaintiffs (Nationwide). HH&K Partner Brian Katz will be installed as the President of the Greater New Orleans Jewish Community Center (JCC) on February 20. He will serve a two-year term as president. Katz is a life-long member of the JCC and has served on its board since 2000. He most recently served as the Executive Vice President and, as president, Katz will oversee the JCC's Board of Directors, who are in charge of major policy decision-making for the organization. As he looks forward to this new role, Katz is faced with the sort of challenges that leaders often dream of having. HH&K Partner Leonard Davis was appointed to the Plaintiffs' Steering Committee (PSC) by the federal judge overseeing all federal cases in the DePuy Hip Litigation MDL. HH&K has been actively representing patients who were implanted with defective DePuy Hip replacement devices that are subject to chronic failure and filed one of the earliest cases in Louisiana federal court concerning this medical product defect. Attorney Jim Klick has been named to CityBusiness' Leadership in Law Class of 2011. He has been selected as one of 50 honorees based on your professional and community contributions, which is no easy task as this year's field was a very competitive class and another record breaker for nominations. Honorees were selected in four categories: Court Associated, Educators, Firm Associated and In-house Counsel. Honorees will be recognized at a cocktail reception from 5-7:30 p.m. March 22, 2011 at the New Orleans Museum of Art.